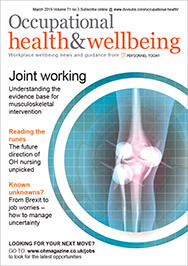 A senior director at a consultancy firm has revealed how an HR-led occupational health scheme run by the company probably saved her life. Angela Stirling, senior director at Rozelle Consulting, was shocked to be diagnosed with a serious illness when she attended a routine health check as part of the company scheme. A heart scan revealed that she had a very high calcium score and she was urgently referred to a hospital specialist. David Clarke, HR director at Rozelle, said the scheme, run by the European Scanning Centre, had been in place for two years and was introduced to help staff lead healthier lifestyles. Stirling’s health scare highlighted the benefits of the scheme and more than justified the company’s investment in it, he said. Clarke described Stirling, who is currently overseeing a major company project, as “one of our most dynamic and valuable members of staff”. “If she had become sick, or worse, it would have had devastating repercussions, both from a personal and a business perspective,” he added. n Research has revealed that employers are paying up to three times as much as they should for corporate healthcare plans, despite the fact that inflation on the cost of these schemes fell to its lowest level in more than 20 years. On average, health plan costs went up 3% last year, but many insurers are still raising prices by as much as 10%, according to Mercer HR consulting.